These Halloween Witch Finger Butter Cookies taste a lot better than they look. You won’t believe how easy it is to make these Halloween biscotti and the edible dirt to place them on. North American Halloweeners have asked that question since the late 1920’s. Since I was never one for tricks, I thought of sharing this very special treat with all of you. Not only are they a treat to eat, they are also a treat to make. The actual recipe comes together in less than 10 minutes. The fun part is shaping the dough to look like witches finger cookies. The actual dough to make these witch finger cookies come together in no time at all. Simply cream the butter and sugar together and then add the egg yolks and the extracts, followed by the flour. The fun part begins in shaping the cookies. As you can see, I will scoop the dough with a small sized cookie scooper and create a thick sized log about 3-4 inches long. Next, pinch the dough to create two indentations to imitate the knuckles/joints of a finger. With a butter knife, create creases to imitate fingers folds and joints. Next, press an almond in the tip of the dough in order to imitate a fingernail. Once baked, carefully remove the almond, place about 1/4 of a teaspoon of strawberry jelly and replace the almond. And there you have it, you have just created a Halloween biscotti in the shape of a witch finger. 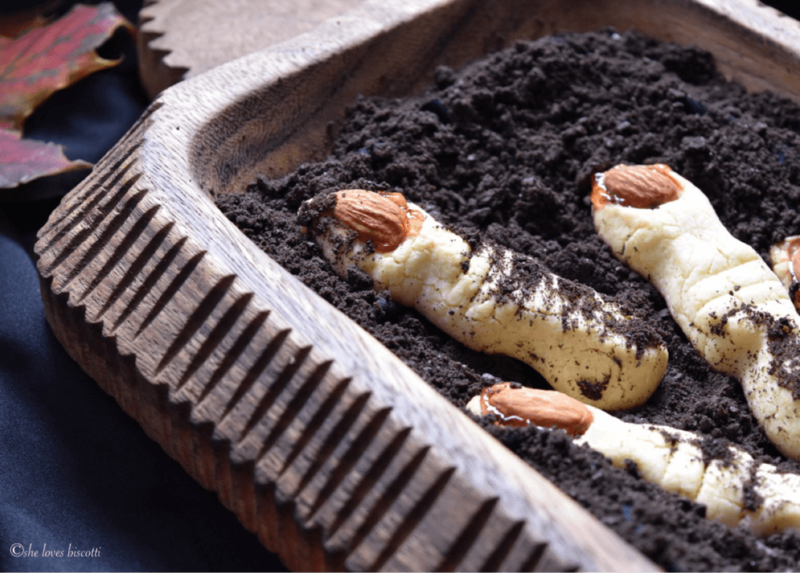 The edible dirt is created by pulsing chocolate wafer cookies in a food processor and using it as a base to lay the witch fingers on. I absolutely love bread! I especially love the smell of bread as it is baking in the oven. As a result of my love for all things associated with bread, I have a couple of cookbooks that focus on bread and bread making. One of my favorites is “The Italian Baker” by Carol Field. There are some incredible bread recipes in this book that I will eventually share with all of you. You are probably wondering right now what does making bread have to do with making these easy witches fingers for Halloween. Well, when I purchased her book, I was pleasantly surprised to see a whole chapter on cookies. 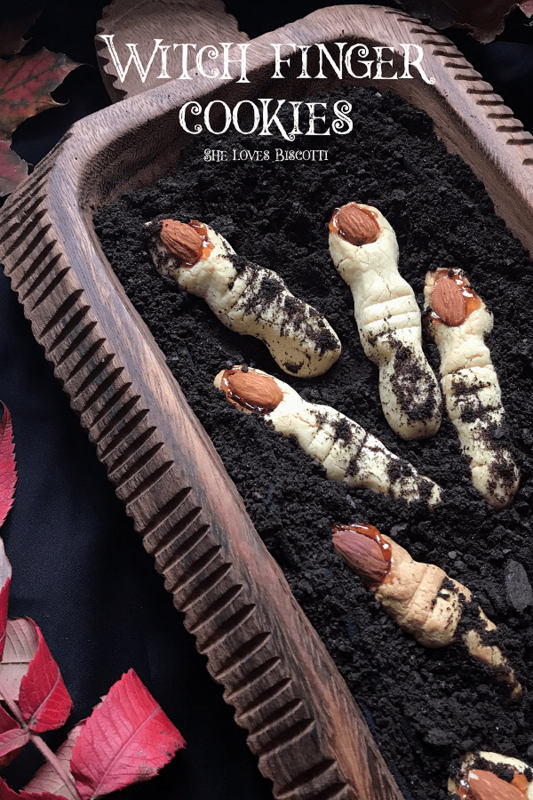 This recipe for these Halloween fingers is actually Carol Field’s Buranelli Cookies. Did you know that Burano is a tiny island in the lagoon surrounding Venice? It is well known for their colorful houses and butter cookies called Bussolai Buranei. These cookies are usually “S” shaped, but today, as you can see, the recipe worked out very well for our Halloween Witch Finger Butter Cookies (if you are interested, here is another recipe for an Italian S cookies). So, the next time someone asks you trick or treat… you know what to ask for! ★★★★★ If you have made this Halloween cookie recipe, I would love to hear about it in the comments below and be sure to rate the recipe! These Halloween Witch Finger Butter Cookies taste a lot better than they look. You are definitely in for a treat, a Halloween treat! In a the bowl of an electric mixer, cream the butter and sugar together until light and fluffy. One by one, add the egg yolks. Make sure to scrape down the sides of the bowl. Add the flour, salt and lemon zest and mix until just incorporated. Scoop dough with small sized cookie scoop and drop on work surface. Roll into a log. Pinch the dough to create two indentations to imitate the knuckles of finger. With a butter knife, create creases to imitate fingers folds and joints. Next, press an almond in the tip of the dough in order to imitate a fingernail. Preheat oven to 375℉ (190°C). Place on parchment-lined baking sheet and bake for 20 minutes or until bottoms are lightly browned. Once cookies are cool, carefully lift the almond and place 1/4 teaspoon of strawberry jelly. If almond cannot be removed, simply dab a bit of strawberry jelly. The "edible" dirt is simply made by pulsing chocolate wafers in a food processor. IF YOU ENJOYED THIS WITCH FINGER COOKIES POST, SAVE IT FOR LATER. PIN IT TO YOUR HALLOWEEN BOARD! Hi Maria thank you so much for this awesome recipe. I made this yesterday and everybody loved them. One friend really was a bit grossed out when she looked at them first but then ate the most. They look so real. So much fun to make! This recipe is a keeper! So creative and clever on all levels – next year’s college care package for certain. Happy Halloween! Thanks Paula ♥ Still playing with my food 😉 Thanks for dropping by, Happy Halloween!